LIVE ON AIR performances by four talented female soloists: Sarah Færch (Sarah Faerch Music), Frederikke Bohr (Frederikke Bohr Music), Kirstine Loubet, and Peach Reasoner (PEACH Blues Band). Tune in / catch the livestream replay FREE at Live & Unplugged on Facebook. Tune In for PEACH on RadioBuzzd with Chris Seaward! LIVE ON AIR interview and airplay on Wednesday, January 10 at 2:30 PM PST (Los Angeles). Tune in FREE at www.RadioBuzzd.com. Tune In for PEACH on Pop Roxx Radio with James Rosh! Live interview and airplay on Friday, July 14 at 8:00 PM EST (Miami) / 5:00 PM PST (Los Angeles Time). Tune in at www.jamieroxx.us and join the conversation by calling in 347-850-8598. PEACH extends her 2016 European tour, performing with Almost Blues Band at several stops from June through August. 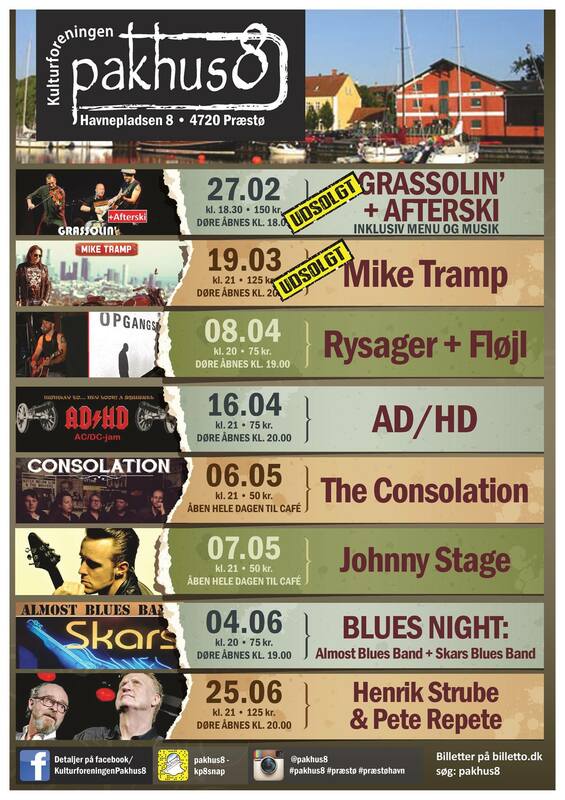 PEACH kicks off her 2016 European tour performing at Café Bartof with the Almost Blues Band (Niclas Campagnol - Drums, Helge Solberg - Bass, Michael Engman - Guitar) and Special Guest Ken Stange! Three nights in a row: Thursday, Friday, Saturday, February 25, 26, 27, starting at 21:00 each night. 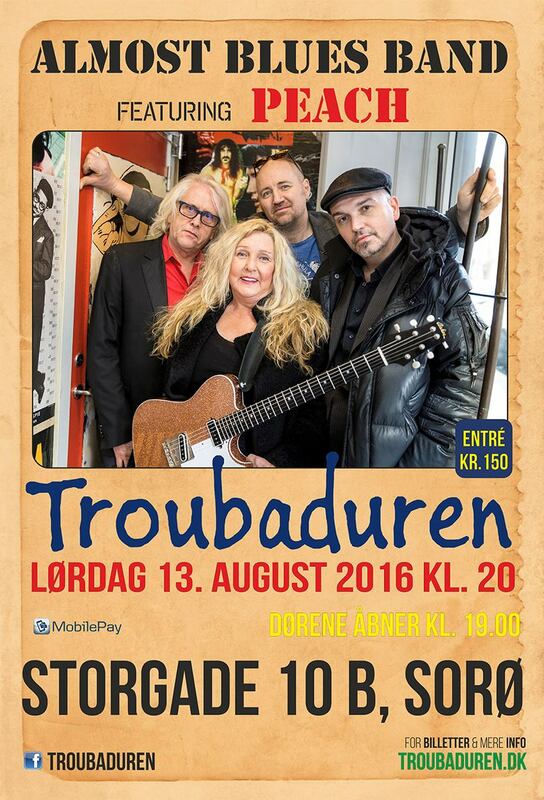 Mark your calendars for PEACH & the Almost Blues Band (Helge Solberg, Michael Engman Rønnow, and Klaus Menzer)! Five performances scheduled including one in Copenhagen on Saturday, 10 October 21:00 at Café Bartof (Nordre Fasanvej 46). 17 OCT - Handvaerkeren (Håndværkeren) Helsingor (Helsingør) - 22:00. PEACH and the Copenhagen Connection perform in concert at the at the Den Blå Festival in DENMARK. PEACH (vox and guitar) Featuring Aske Jacoby (guitar), Stefan Pasborg (drums), Fredrik Damsgaard (bass), and Troels Jensen (keys, guitar). PEACH and the Copenhagen Connection return to perform at the world-famous Mojo Blues Bar in DENMARK. PEACH (vox and guitar) Featuring Aske Jacoby (guitar), Stefan Pasborg (drums), Esben Just (keys), and Fredrik Damsgaard (bass). 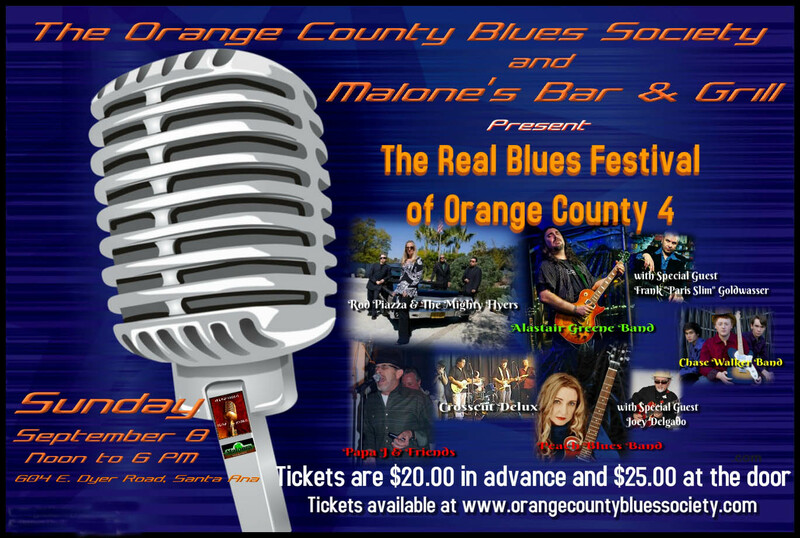 PEACH is the live in-studio guest of "Laguna Blues" host Kenny "Big Daddy" Williams on KX93.5 FM! 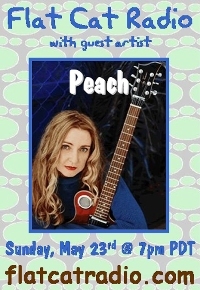 PEACH discusses cool things currently going on in her career, including her triumphant return to Copenhagen to perform at their #1 blues club, Mojo Blues, August 7; as well as performing at the Den Bla Festival in Aalborg, Denmark on August 14. PEACH performs at Mojo Blues Bar in DENMARK feat. Aske Jacoby! 21 & over. $10. Buy Pre-Sale Tickets Now! PEACH gives an exclusive radio interview to DJ MR.WILL on Faces of Success Radio. Use this link to isten in or call in and speak with the host at 718-664-6324. PEACH performs at M15 Concert Bar & Grill! "Ladies Sing the Blues" night also includes performances by Sena Ehrhardt and Shannon Curfman. $15 cover. ALL AGES. Doors open at 3 PM. ALL AGES. $10. Buy Pre-Sale Tickets Now! PEACH & The Blues All-Stars perform at the 2014 UnTapped Blues & Brews Festival at the Benton County Fairgrounds - Kennewick, WA. TIME TBA. PEACH & The Blues All-Stars perform at Biscuits & Blues. Two show times: 7:30 PM and 10 PM. Call venue for tickets and reservations. PEACH interviews on KUDZOO Radio Hour with Rocky Lark. Tune in at Blogtalkradio.com. SoCal blues guitar goddess PEACH interviews live on Jimmy Warren's "America's Blues Radio" show. Tune in at www.americasbluesradio.com. Interview audio archive [MP3 | 77 MB]. PEACH performs at Voodoo Lounge at House of Blues - Los Angeles (Sunset). FREE - no cover, all ages. PEACH & the Blues All-Stars perform at Maui Sugar Mill Saloon. YOU'RE INVITED to be part of a PEACH music video! Listen for PEACH's music and interview on GoldRadio.org's "Blues With A Feeling" show with host Richard L'Hommedieu. PEACH live on Behind The Mic Radio at 5pm PST/8pm EST. Call in and interact: 347-945-6965. PEACH joins Take 2 Radio for a chat about her career, her new music, upcoming tour, and being the co-founder of Rock 'n Cure. PEACH ON FLATCATRADIO.COM: Join DJ Dave Strauss and PEACH as his in-studio guest (End Time Estimated). PEACH is the featured artist. $20 tickets available online at the venue website. Listen to K-FROG radio for a commercial promoting PEACH's show at the Old Town Temecula Community Theater on FRI, Jun. 5, 2009 @ 8p. PEACH and her full band perform. PEACH and her all-star blues band perform. PEACH performs for the Emergenza Festival Finals. At stake is an all-expenses-paid trip to Europe as determined by audience vote & music biz judges. Join the crowd and help PEACH WIN! PEACH will be featured on the radio show Rockwired Live as winner of the Best Female Artist Showcased in 2006. PEACH is playing with her house band: Ken Stange (Joe Cocker, Dennis Quaid) on keys, Tom Walsh (Joe Cocker, Dennis Quaid) on drums, and Eric T. Ward (Marvin Gaye) on bass. PEACH reports that it's a really fun and relaxed atmosphere, no cover, great hang... check it out! Live radio broadcast with PEACH on KUCI 88.9 FM - broadcasting over the air and online from University of California, Irvine. PEACH performing with full band: Ken Stange, Tom Walsh, Jimmy Roberts, Eric T. Ward, guest guitarists Joey Delgado and Burton Zimmer. Free security parking. 21 and over, please. $5 admission. Proof of age required. Other performers to include Zola Moon, Oscar Jordan, Jimmy Z, Deacon Jones. Guest guitarists Kimberly Allison and Joey Delgado will be sitting in with PEACH and her band. PEACH will be performing a rockin' rhythm and blues set with the LA Blues All-Stars, including the full-throttle horn section. Look for PEACH at the "Lace" booth, endorsing her guitars from Spirit Musical Products. 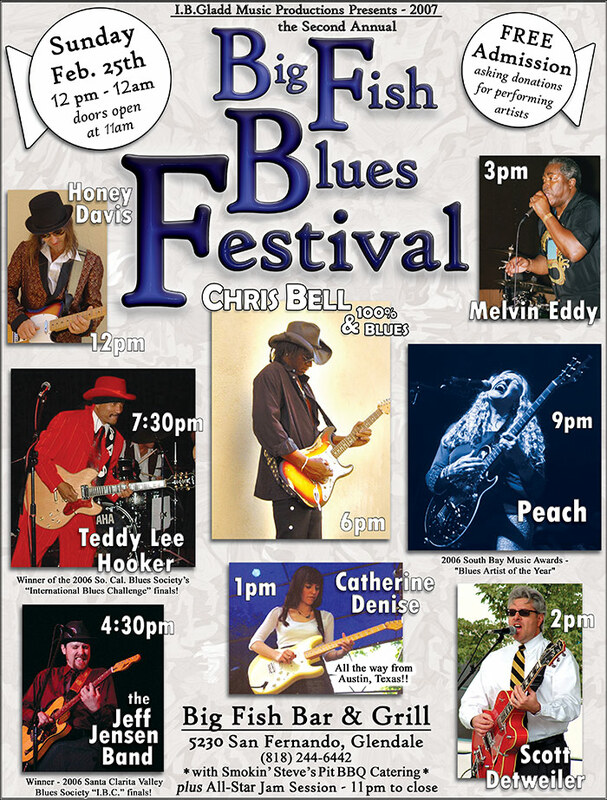 PEACH will be playing 2 songs and receiving the award for Blues Album of the Year at approximately 9:30 pm. Doors open for the public at 6:30 pm. Event is scheduled for 8-11 pm with the after party at the same location. PEACH (guitar and vocals), Marty Grebb (Bonnie Raitt, Leon Russell, Etta James), Maria Martinez (Barry White), Alicia Morgan (Bobby Womack), Tim Scott (Eric Clapton, Stevie Wonder, Tower of Power), Paulie Cerra (Bobby Bland, Lucky Peterson), George Pandis (Don Ellis), Cece Worrall Rubin (Guns N' Roses), Joey Delgado (The Delgado Brothers). if you would like to attend. Tell us how many are in your party. PEACH Interview on WFDU Radio 89.1 FM. Streaming on the internet at www.kcsb.org.